In my first year and seventh game at Clemson in 1978, junior safety Rex Varn intercepted a pass at NC State and raced 94 yards for a touchdown. It is still the second-longest “pick six” in Clemson history and his second interception return for a touchdown of 90+ yards, the first and still only Tiger in history to do that. Today, Varn is still Clemson’s career leader in interception return yards (275). 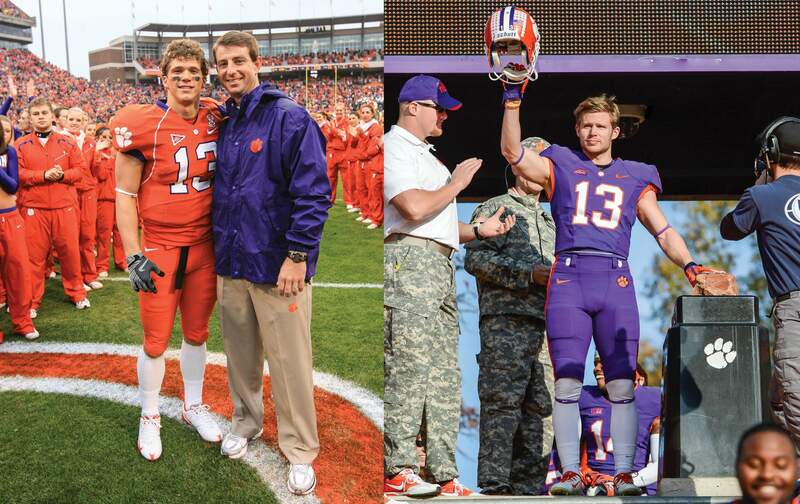 Varn wore #13 at Clemson, and in many ways, he started a tradition of excellence for players wearing that number. He would go on to earn First-Team All-ACC honors as a senior, the first Tiger to receive that accolade while wearing what is supposed to be the “unlucky” #13. Other players of significance have worn that number with distinction since then. Rodney Williams wore it proudly as Clemson’s starting quarterback from 1985-88, and his 32 career victories as the signal-caller are still tied for most in school history with Tajh Boyd and Deshaun Watson. The tradition of #13 has taken on new significance in the last 14 years, as wide receivers wearing the number have flourished. Since 2005, wideouts who have had the number have combined for 431 receptions for 4,461 yards and 26 touchdowns. All three of the pass catchers reached at least 125 receptions and at least 1,000 receiving yards. The tradition began with a phone call to Tyler Grisham in the spring of 2005. “Coach (Dabo) Swinney called me during the spring of my senior year of high school,” said Grisham, who came to Clemson from Birmingham, Ala., the same home area of Swinney, who was the wide receivers coach at the time. “I had worn #8 in high school. I was worried I was going to get some number in the 30s (not a popular number for wide receivers), but he asked me if I wanted to wear #13. Grisham went on to have an outstanding four-year career with the Tigers, accumulating 132 receptions for 1,390 yards and eight touchdowns. He went on to play in the NFL with Pittsburgh and is now in his fifth year on Swinney’s staff as an offensive analyst. When Adam Humphries came to Clemson as a freshman in 2011, coaches believed he would fill the role Grisham had provided as a reliable slot receiver. But #13 was not available, as placekicker Spencer Benton already had it. Benton, by the way, kicked a school-record 61-yard field goal against Ball State while wearing #13 in 2012. When Benton graduated, Humphries moved from #16 into Grisham’s #13. He finished his career with 127 receptions for 1,097 yards and three touchdowns. Today, he is one of the top wide receivers for Tampa Bay. During Humphries’ senior year, a walk-on wideout from Myrtle Beach, S.C., named Hunter Renfrow was redshirting. He wore #35 and was standing out in practice. Renfrow caught the attention of all the coaches on both sides of the ball. When it came time to assign numbers for the 2015 season, Grisham, who was back at Clemson on Swinney’s staff, made a suggestion. “No one really called to tell me I was going to move to #13,” said Renfrow. “When I came to the first mat drill in January 2015, I had #13 in my locker, so that is how I found out. Renfrow has obviously continued the tradition. He has 172 receptions for 1,974 yards and 15 touchdowns in his career, and with one catch today, he can set the Tiger record for consecutive games with a reception (39). And of course, his game-winning receiving touchdown from Deshaun Watson in the national championship game against Alabama will live forever in the hearts and minds of Tiger fans. As a member of Swinney’s staff the last five years, seeing the success of wide receivers wearing his former number brings pride to Grisham.